Here are more from the bridge series. 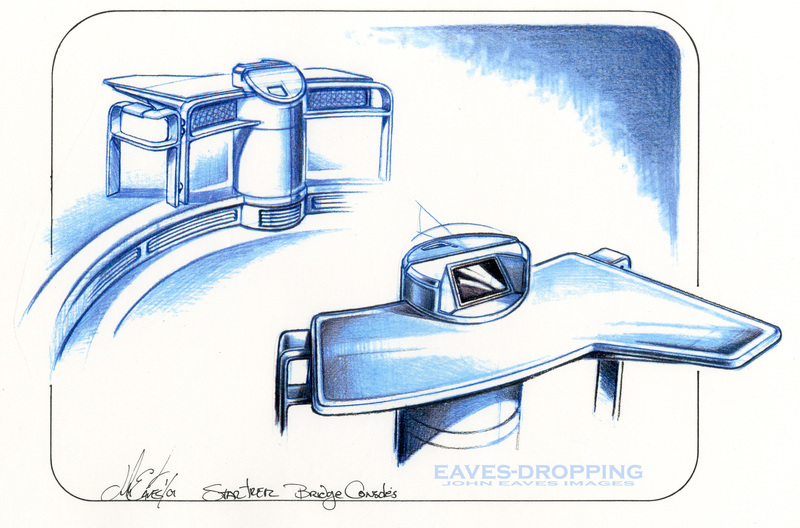 Doug’s beautiful exterior designs really made for exciting interior sets and compartments. Doug and Mike pushed for the Jefferies Tube set only to both get big fat punches in the face!!! NO Jefferies Tube on this ship!!!! They got their way when we had to recreate the TOS sets a few years down the line!!! To follow up yesterday’s navigational station post, here are the drawings and concepts that led to the floating and side stations on the bridge set. Herman Zimmerman was quite the giddy one on this show, and he had the time of his life designing these sets. Having the history and experience of creating so many other bridges, he pulled all of his knowledge together to make his ST masterpiece sets. By applying the old philosophy of “If I had the chance to do it over again I would incorporate what I’ve learned from the past,” he designed this set in such a way that it was a very easy set to film in. Making the set full of wild walls and pull out panels and viewscreens, you could get the camera anywhere. In addition to that, he worked the filming lights into the set, so set-up time would be greatly reduced!!! He is truly a genius at this and he is one heck of a nice guy to boot. angular and tubular don't mix! Mike and I had talked about how cool it was to see the operations manual on board the Space shuttle and at the stations of the Navy ships we had been on, and thought it would be cool to have one at all the stations on the bridge of the Enterprise as well. This is the spiral flip book version that later became Mike's hard bound text manual. The shots of the crew putting everything together are interesting. I don’t tend to consider all the skilled labourers involved, from electricians to carpenters and so on. I just think about the designers sketching it all out and then the actors standing on the completed sets. A nice insight there. I really like the open feel and, as I mentioned before, the ability of the cast to interact. The swiveling and sliding chairs allow them to easily face whatever direction is necessary quickly, either as part of the story or for the cameras. Adding the information about Herman and the fact that he designed the sets for such ease of setup and film makes me appreciate it all even more. I really like the Operating Manual and think that would be just awesome to have…a pretty, gold Ops Manual for the NX-01! Man, that would be sweet!! Mike made one for everyone in the art department,, I have mine in a glass display case at home so if your ever out you can come over and touch it!! HAAAA! Beautiful work John – I really liked the “practical” look and feel of the NX-01. It always amazes me how much behind the scene effort is involved bringing these types of shows to life. Thank you! Mayweather was supposed to be the navigator! Ah, so he DID pull double duty. One of the best features of all the NX interiors was the sense that it was a real, functional, practical (albeit futuristic) design. The bridge is certainly the most sensible and “real-world” work oriented of all the various designs over the years. Switches, monitors, keyboards, displays…right down to the padded wrist rests on the consoles, the operator’s manual, and the grips on the vertical surfaces. I’ve necver thought the NX looked “more advanced” than TNG-era ships for this and other reasons. thanks Tim, Pulling back from the inset monitors and using the flat screens mounted off the wall really pulled the look back and away from the tng and Tos look. Flat screens were still pretty much on the very $$$$$ expensive and the cutting edge of new gadgets in 01 and it was really a wild treat to see that bridge when everything was fired up!!! The NX interiors are beautifully designed, though I was never keen on the bronze colour scheme. Didn’t like it then, still don’t like it in retrospect. Combined with those purple overalls it made the series singularly unpleasant visually. I do love the design work however, the physical buttons, the levers – it could easily have been cheesy, but in the execution it worked. Just a pity about the colour scheme. I didn’t mind it but it doesn’t matter to me because i don’t see those colors,,, not in my color blindness scale!!! I’ve got mixed feeling on the NX bridge…I love the pilots station with the control yoke and the sliders a pushy thingies. I also love the fact that there is a fligth manual at one of the stations. I am sure there is a manual online in the ships computer, but the reason for a old paper manual would be for back up…computers can fail. And again it’s a nice touch to pilots and astronauts today. As far as the stations I guess it’s just hard to top Matt Jefferies clean functional and ergonomic bridge layout of the original ship. There’s parts I like of the NX bridge and others not so much, but you and the crew did do a great job on it! Hard to top or even equal anything Matt did!!! he set the bar very high and it still stands perfectly fine even though it was over 40 years ago. can’t really fix perfection, you can only try to honor it! As I said over at Doug’s blog, the NX-01 sets were had the most verisimilitude of all the ModTrek sets. I felt like I was on a starship that could really be built in the here and now, as if it could take off at any moment from Paramount Studios. These explorations are a lot of fun to see, John, thank you for sharing. I’m loving some of the concepts that you proposed for these stations. I have a question that you may have an answer to regarding the sets themselves – What’s going on with all the texture painting on the consoles? I even noticed it in the latest Star Trek movie (particularly the shots of the transporter console). It’s becoming more and more noticable with all the HD versions out there. Note your picture above (b, operations manual). I’m guessing it’s to cover up the fact that a lot of these components are made from MDF, plywood, etc. but I’m curious if perhaps it’s a mechanism to add a level of busy tones to what you see on the screen. Awesome info John 🙂 And I love the flight manual touch. Something we never saw on screen. ooooohhh that was my favorite part too! John Thanks for the sketches and the photos!! Will you be showing off any of the graphics of the screens or on the controls. Its very hard to see them on tv and I can’t find a lot of photos of them. We might have to put in a call to Mr Mike Okuda for those. Yes I want to do a mike Okuda day soon so I’ll gather the pics for that day!!! good to see ya Joe! been a while! But I have to ask you, John. Why so many handrails? I imagine they thought that it would be good to have something to hold onto if they were getting fired upon or maybe went through a rough patch of debri or such. I remember seeing all the flying bodies in the saucer section of the “D” when it crashed! Handrails may have been a bad thing in that extreme case, but that’s the idea anyway. If you loose the artificial gravity, you might need something to hold on to. And not Hoshi or T’Pol! Because they would be flying around, too! Nice answer. Thanks for the pics of the consoles, the one thing I always liked about the NX-01 sets were the black ID tags on everything, I spent 12 yrs in the Navy and we had the same thing, it is a small thing that you wouldn’t normally notice but it does help ground everything in reality, as if we could amost build it today. About the Jefferies Tubes…I loved the 60’s era design you guys did for the TOS sets, but I also really liked the whole complex of sets built for the catwalk stuff. You have that cool off-corridor set with the angled ladder well and then you come up in that really great catwalk set with the doors that let you suggest it ran the lenght of the nacelle. Really great set. The NX bridge is lovely. Love that everyone can look at the view screen or at each other. It seems very functional yet very complex. I have always been fasincated by the behind-the-scenes production of TREK ever since I read “Inside Star Trek”. It’s nice to see some DS9 & ENT production design sketches & BTS finally showing up. Paramount let us Trekno & TV production fans down by not releasing any BTS info on TREK since DS9’s season 1. Then ENT came along and it was truly a blackout of info. I would love several new TREK BTS coffee table books.